Bad luck is often attracted when there is a lot of stress around; good luck is attracted by happiness. Which is why those who are already happy/in love/wealthy seem to get ever more and those who are already miserable tend to get more and more misery heaped upon them. 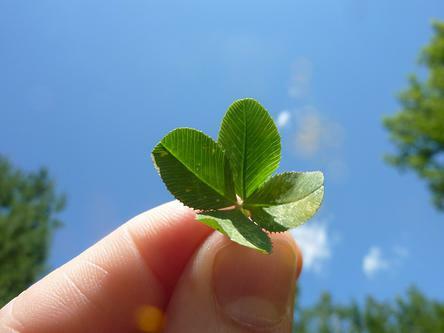 An excellent good luck charm would be something that represents something happy to you, something you love. Sunshine for example, represented by a sun or a disc is a positive happy energy form for some people. Some people make a good luck charm out of the picture of one of their kids, because that's what they love and what makes them happy when they look at it. Some people choose a Jesus medallion or a Saint they love for a good luck charm. Some love crystals so for those, a nice crystal makes a good luck charm. Have a think on what you love, and what makes you happy. Something that brings out the best in you, something that you can give a kiss for luck and you can instantly feel something, a shift, like something has changed. You can experiment with different things too, and over time learn to match different charms to different occasions or topics. Most importantly, remember the HAPPY = LUCKY connection. Things that make you happy are those things that attract luck. PS: Also see this Energy Stress Chart - how stressed are you?